Five years after its record-breaking performance, Infiniti’s iconic Q70 has held onto its top spot as the world’s fastest accelerating full hybrid. Driven by journalist Tim Pollard and overseen by Guinness World Records®, Q70, or the M35h as it was known then, covered the standing 400m in just 13.9031 seconds (average of all runs). The test car, a standard production model, set the record on Tuesday 23 August 2011 at the UK’s Santa Pod Raceway, home of the FIA European Drag Racing Championships. From a standing start, the M35h harnessed its combination of electric motor torque from 0rpm and V6 power at high revs to impressive effect, the car passing the computerised timing equipment at the end of each run at speeds in excess of 160km/h (100mph). 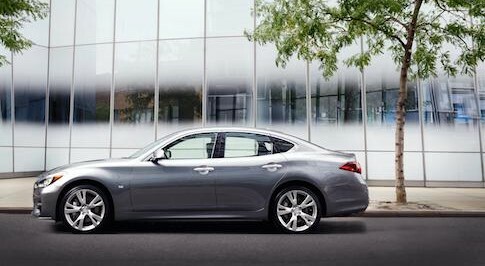 "The Infiniti M35h proves that hybrids can be fast as well as frugal," said Tim Pollard, associate editor of the UK's CAR Magazine. "At Santa Pod you could feel the instant torque of the electric motor away from standstill – the car just leapt off the line. I did try changing gear manually, but it was fastest left in automatic. That was when we achieved the fastest single run of 13.8960 seconds. Five years on, the Infiniti Q70 remains top of the leader board on the Guinness World Records® website.